After the Asian Games, will you give up on Gilas? It has been a eventful 14 months in the history of Philippine basketball. From winning silver at 2013 FIBA Asia Championship on home soil. To those thrilling tune-up games leading up to the 2014 FIBA Basketball World Cup in Spain. To the eventful return of Philippine basketball on the world map with a gallant performance at the 2014 FIBA Basketball World Cup. Despite the fact, Gilas Pilipinas won only 1 of 5 games and did not making it to the next round of the tournament finishing 21st in the 24 team tournament. The world was put on notice with what they have accomplished. All the way to Incheon for the Asian Games. Where unfortunately, the team suffered a disastrous finish settling for only 7th place in the tournament. The tournament was a disaster for the national team. After winning their opening match against India, they suffered a tough loss against Iran where the team kept in close distance with the Iranians. Then into the next stage of the competition, they suffered a shock loss to Qatar. Followed up by another tough loss against the host nation and eventual gold winners Korea. Then a victory that felt like a defeat against Kazakhstan ending the medal hopes of the team. Losing to China and ending the tournament with a win over Mongolia for the 7th place finish. With a twist of fate, the team that brought a nation together, has completely tore it apart. As the critics emerged blasting the team on every aspect. Majority of the brunt was put on Gilas head coach Chot Reyes. Reyes, who on a press interview blasted naturalized player Marcus Douthit after the loss to Qatar which led Filipino basketball fans to blast him on his own miscues during the course of the tournament. Primarily on the team’s failure to execute in end game situations that has been present even in their stint at the FIBA Basketball World Cup thus leading to the infamous moniker that is “Choke” Reyes. In addition, to his choices on rotating players during the course of the game. Calls for him to vacate his coaching job for the nationals spread like wildfire. Critics wanted to give other great coaches like Tim Cone or Yeng Guiao the opportunity to call the shots for the nationals. The downfall of the team in the Asiad, unfortunately overshadowed Jimmy Alapag’s farewell run donning a “PILIPINAS” jersey. This after he came out for one last shot with the national team after earlier calling himself to retire after the tournament in Spain. As well as the good name that this team have put on the basketball world map during those eventful days in Sevilla. This graph pretty much explains how “most” people felt after each tournament that Gilas had played since last year. Photos used were from multiple blog sites. For obvious reasons, I did not choose to use a person from Gilas Pilipinas for this graph. It would undo everything that I wrote in my previous blog entry. As a fan of this team. I am saddened as any Gilas fan there is in the world about the outcome of the last tournament. After all the hard work and inspiration that this team gave to the nation. The team indeed suffered a major setback in those tough days in Incheon. That forced own basket vs Kazakhstan pretty much summed up all the struggles this team encountered. I may have the right to exercise tough criticism on the team itself. However, I choose not to do so. I mean on a personal note, it is unfair to criticize someone for not being able to execute what the people wanted. As far as Coach Chot Reyes is concerned, I’m not blaming him. I mean what’s the point?!? You give praise when he coaches well enough to win games for the team, but stab him in the back when he commits something unforgivable in coaching that the team losses. This ain’t the first time that anyone on this team has been criticized, remember Gary David at last year’s FIBA Asia tournament? Some fans called him out not worthy of being a part the national team after his struggles during the tournament. Fortunately for Gary, his fellow players and most people backed him up and was instrumental in that quarter-final win vs Kazakhstan last year. His critics have valid points which are worthy of consideration. I can honestly say, he is the most polarizing head coach that Philippine basketball has ever seen. Some people love him, some people hate him. But I have to say he is still one of the best coaches this country has ever seen in this generation. Take out what happened in Incheon, he coached the team back into the world stage of basketball. I’m not asking anyone to stop sharing their sentiments good or bad. For one fact, that this nation is truly obsessed with the game of basketball. That is something I truly admire about our passion for the sport. There is the outspoken minority of Filipinos who think that we should focus on sports where we can actually have a better shot of success or winning a medal in international tournaments. We should not forget about them too. After all these kind of tournaments aren’t always about basketball. It was unfortunate that only a few got to learn about these medal finishes by our athletes. Indeed, it should be a stepping stone to improve the general standing of Philippine sports. I do hope that our sports program gets better in the near future. In ending, as for Gilas Pilipinas in the near future. For sure, it will debut a new look team once the next tournament comes next year which is the FIBA Asia Tournament that is a qualifying tournament for the 2016 Summer Olympics in Rio de Janeiro, Brazil. The winner of the tournament automatically qualifies for the Olympics. While the second and third place teams will have to go through a Olympic qualifying tournament for three wild card spots at the Olympics. Whether Gilas management decides to keep Chot Reyes or choose another coach. So be it as long as it’s for the best interest of the program. Is it time to give up on this team? I personally think otherwise. As a fan, I will continue to support the national team 100%. If there is anything that I have learned as a fan of teams like the Houston Rockets and the UST Growling Tigers. That is to never give up on a team no matter what happens. Stick through everything good or bad. I have yet to taste genuine joy as a basketball fan whenever a NBA Finals or UAAP Finals is being played out as both of these teams have not won the championship in their respective leagues ever since the day I started rooting for these teams. Some of my friends have tasted that genuine joy whenever their team/school won the title. Yet I come back every year with renewed hope that one day they will reach the promise land and as a fan I get to taste the joy of going all the way to the promised land. There will be time for the wounds to heal. 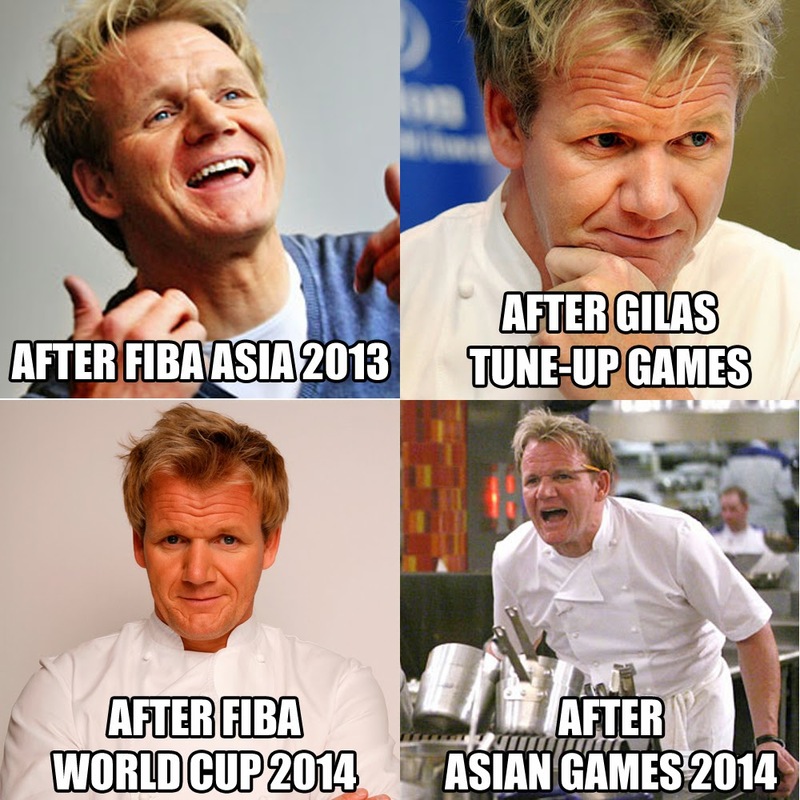 It will be another 11 months until Gilas Pilipinas returns to battle in the Asian stage. As a fan, will you give up? or hang on through good and bad times? 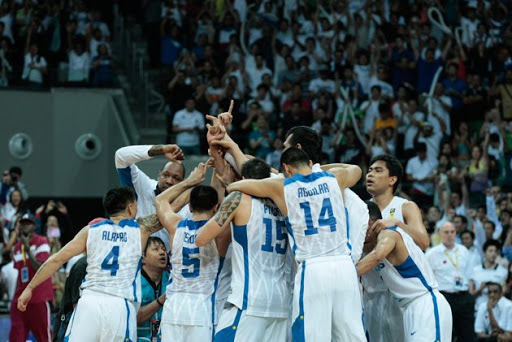 Gilas Pilipinas 2014: The team that brought Philippine basketball back on the world map. Prior to writing this one, I have seen a lot of writers and bloggers that have already written their take on this matter. Even so, I will still write this one. The passion is burning high on my body, on my mind and in my heart. So let’s get to it. For the last six days, Filipinos within our soil and around the world witnessed one of the defining moments in the history of Philippine basketball. The story of a nation’s unlikely love affair where in the eyes of anyone outside a Filipino is a genetic mismatch when it comes to the international stage. For the last six days, Filipinos set aside their differences to unite as one nation in support of a team carrying “PILIPINAS” in their royal blue, white and red jersey. The nation went through a lot over these six days over Sevilla, Spain. From the glimpses of brilliance that shocked the world of basketball to the unimaginable heartbreak when we fell short after a great fight against the countries this team battled. When it all ended with a sweet and hard-earned victory over Senegal. There was pride, hope and optimism running through every Filipino who bare witness to this moment. Whether they were in Sevilla throughout their run, on home soil, or around the world where a Filipino is watching this moment. Truly this was a team that despite falling short of victories on the win column will be remembered as the team that brought Philippine basketball to where it truly belonged, on the basketball world map. Let’s run down a few of the memorable tournaments of this run by Gilas Pilipinas at the 2014 FIBA Basketball World Cup in Spain. When Gary David or Japeth Aguilar, despite playing limited minutes giving a boost on the scoreboard whenever they score a basket. LA Tenorio competing tooth and nail with Puerto Rican NBA veteran J.J. Barea in a showdown of court generals. Ranidel De Ocampo, Paul Lee and Jeff Chan dropping three point bombs on the scoreboard. The grit of a Marc Pingris and Jayson Castro who played through the injuries to give everything they have and show the world what “PUSO” means to the Filipino nation. Gabe Norwood’s work on the defensive end and two Kodak moments when he delivered two highlight reel dunks over Argentina. One of which was over NBA and international veteran Luis Scola. The overall efficiency that June Mar Fajardo brought throughout the tournament and a inside presence this team lacked in previous tournaments that spanned over generations of basketball. The play of Andray Blatche, our naturalized NBA player who lit up the scoreboard with three pointers and drives to the basket. He also played through injury showing that he may not be a born Filipino, but his heart and passion showed the grit of a Filipino. The Captain Jimmy Alapag who played in his final international tournament carrying the PILIPINAS blue, white and red. Dropping three point bombs that were beyond NBA range. The steady play on running the offense and sending us home with our heads up high by nailing clutch free throws in the team’s final game over Senegal. Of course the coaching staff, led by Coach Chot Reyes together with assistant coaches Norman Black, Jong Uichico, Josh Reyes and consultant Tab Baldwin. It was with their sacrifice of calling the shots for the team that bare fruit. They went through a lot especially in a nation where both players and the coaches are under the microscope at all times. For everyone following the PBA every conference, they set their differences aside for each other. Imagine this, Alaska fans cheering once again for LA Tenorio. San Mig Coffee fans cheering every Jeff Chan and Paul Lee three point bombs or Gabe Norwood tearing the rim down and stop. San Miguel Beer fans (just like me) cheering a Jimmy Alapag long bomb or Ranidel de Ocampo bucket. Rain or Shine fans cheering on the grit of Marc Pingris. This team gave the world of basketball something to remember. Who would have thought that this team would compete in close games to some of the world’s best countries when it comes to basketball? Prior to the tournament, people expected Gilas Pilipinas to lose by huge double digit margins. This team proved to the world otherwise. They only lost by three points in a game that went into overtime, in the very first game of the whole tournament against 16th ranked and 2013 Eurobasket 4th placer Croatia. They lost twelve points to 5th ranked and one of four tournament wild cards in Greece. They only lost by four points to 3rd ranked and one-time Olympic champions Argentina. The biggest heartbreak came when we competed well against 17th ranked and 2013 FIBA Americas runner-up Puerto Rico only to fall short by four points. Sealing our fate of not advancing into the next stage of the competition. The final game against Senegal is when the door was finally broken as they won in overtime by two points ending their run on a positive note and to the delight of every Filipino as they win a game for the first time at the FIBA Basketball World since 1974. Imagine that, 40 years since the last time a team carrying “PILIPINAS” won on the world stage of basketball. What also made it special is that this team gained new found respect and along the way. From international sports writers and analysts like ESPN’s Mark Jones, Mike Prada of SB Nation, and NBA writer Couper Moorhead. To Sergio García-Ronrás who is in a way a Spanish equivalent of Grantland writer, Pacific Rims author and Pinoy Hoops host Rafe Bartholomew, who followed this team starting from their tune-ups in Guadalajara, Spain against teams like Angola, Egypt and the Dominican Republic and drove 600 miles to Sevilla to follow the team into every single game of this tournament. The team also gained the respect also from opposing players and coaches, Argentine coach Julio Lamas was quoted that their game against the Philippines was “the most difficult game he coached” in his coaching career. Puerto Rican point guard J.J. Barea giving props to Gilas guard LA Tenorio. Greek coach Fotios Katsikaris acknowledging the tip he got from his Philippine-based friends about how good the team is. 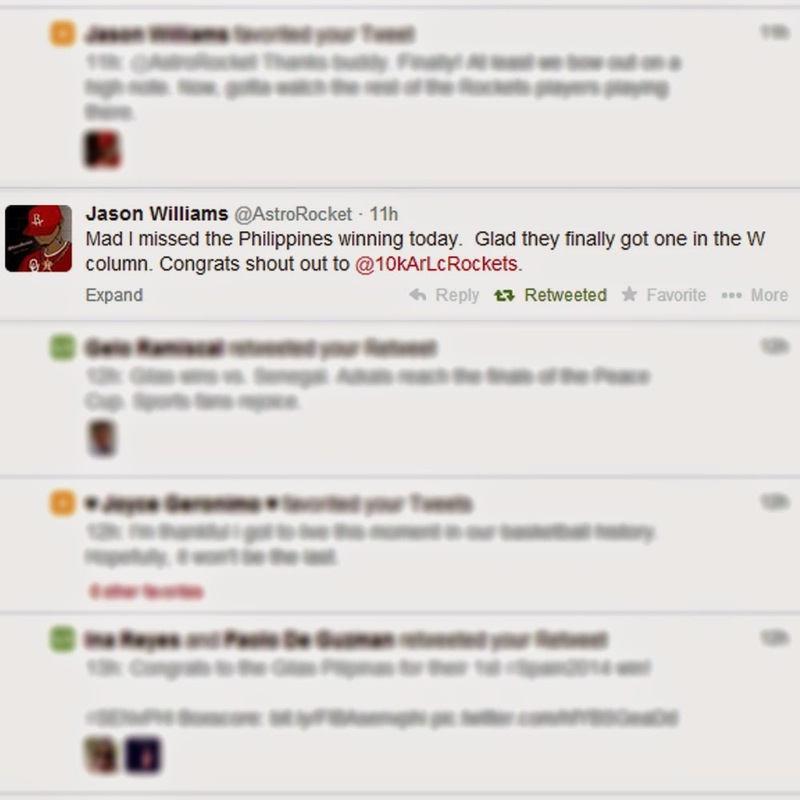 Also on a personal note for me, there was also a guy who goes by the name of Jason Williams who like me is a huge Houston Rockets fan. From the first game of the team in the tournament, he fell in love with the team. He said to me after the Philippines lost to Puerto Rico that it was like seeing the Rockets misfortunes the past season all over again. But when the win over Senegal came. He gave me a nice shout-out. Well, there will always be scrutiny about how this team played out. Filipinos whose love for basketball is unlike the world has ever seen (take Lithuania as our equal when it comes to passion) will have something to scrutinize. As they say, it’s always easy to scrutinize whenever you’re sitting at home eating good food, drinking a good cup, and being with your family watching the game. People pointing on coach Chot Reyes and his choice of rotation of players, on why he didn’t play certain players in crunch moments. People pointing on Andray Blatche’s play in which some critics reminded them of his notoriety during his playing days in the NBA with the Washington Wizards and the Brooklyn Nets. People pointing on Jayson Castro’s late game decisions. And a host of other scrutiny a person can think of. And also the thought of racism among some Filipinos over opposing players. One notable victim was Croatian player Dario Šarić who was born with a cleft lip, bore the brunt of racist comments by Filipinos on the FIBA Facebook page showing his photo. Again, just like everyone who carried the “PILIPINAS” royal blue, white and red. He was carrying the “CROATIA” red and white and the hopes of another nation. Nobody wearing their respective colors, whether it be PILIPINAS, USA, España, Lietuva, Brasil, México, Srbija, Dominicana, Slovenija, Hellas, Türkiye, France, Puerto Rico, Senegal, Angola, Croatia, Argentina, Finland, Australia, Ukraine, New Zealand, I.R. Iran, Korea or Egypt (Yes, I have to mention what is on the jersey of every nation that played in this tournament) deserves to be disrespected like that. But enough with my rant, let’s keep this as optimistic as possible. The run of our national team may have come to an end. However, we’ll come out of this with renewed optimism. Optimism and hope that this run won’t be the last one we’ll see in our lifetime. For Team Gilas Pilipinas, this ain’t the end but only the beginning of something special. I believe, we believe. Let’s move forward, on to the next tournament, in the 2014 Asian Games in Incheon, South Korea and the next FIBA Asia Championship in China come 2015. Hopefully we can play on the Olympic stage on the 2016 Summer Olympics in Rio de Janeiro, Brazil. And I am supporting our bid to host the 2019 FIBA Basketball World Cup which will grow from 24 teams this year to 32 teams. Let me say this with pride once again. 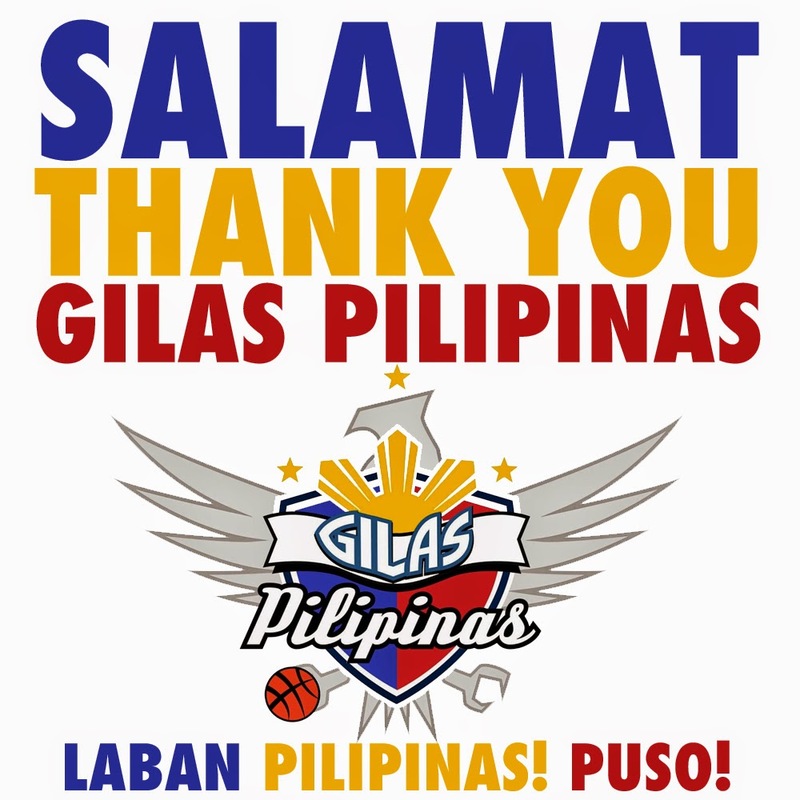 THANK YOU GILAS PILIPINAS. For giving us a reason to come together as one nation. Looking for more journeys with our team in the future. Thank you for a great run at the 2014 FIBA Basketball World Cup. International basketball will never be the same. Yesterday, basketball fans from all over the world we’re watching the Blue vs White exhibition game of the United States’ basketball team that will compete in the 2014 FIBA Basketball World Cup in Spain. The game which was played at the Thomas & Mack Center in Las Vegas featured players who look to earn a slot to represent their country as the US defends it’s title in August. The game had it’s highlights. Derrick Rose who missed majority of the previous NBA season showing his explosiveness that basketball fans missed during his time on the shelf. Damian Lillard lobbing up a 70 foot buzzer beater. As well as many more highlights. But, in one instant what was supposed to be a showcase turned into a nightmare. There are videos and photos of the incident scattered around the internet. However, due to the graphic nature of the injury. It will not be shown in this entry. James Harden was running for a fast break attempt, behind him was Paul George who was looking to make the defensive play. Disaster strikes when George after he tried to block Harden’s attempt landed on the hoop stanchions causing his right foot bend like a pretzel. In a similar fashion to Anderson Silva’s kick during his second battle with Chris Weidman to cap off 2013 in UFC. Immediately, the Thomas & Mack Center went silent. The players, coaches and fans were in disbelief. Tears ran down among those who witnessed the terrible injury. Harden was down to his knees, Kyrie Irving was crying on his father’s shoulders, Derrick Rose had thoughts on what he went through in recent years. The game was eventually called off, George was escorted to hospital on a stretcher. Both squads huddled up in arms for George. Immediately after the injury, which caused a stream on social media as people remember similar freak injuries that have happened in recent years. From Anderson Silva to Kevin Ware’s Elite Eight injury last season to Shaun Livingston’s injury from years ago. Fellow NBA players, athletes, coaches, team executives and fans from all over the world sent their thoughts and prayers to George for a speedy recovery immediately after the news broke out. 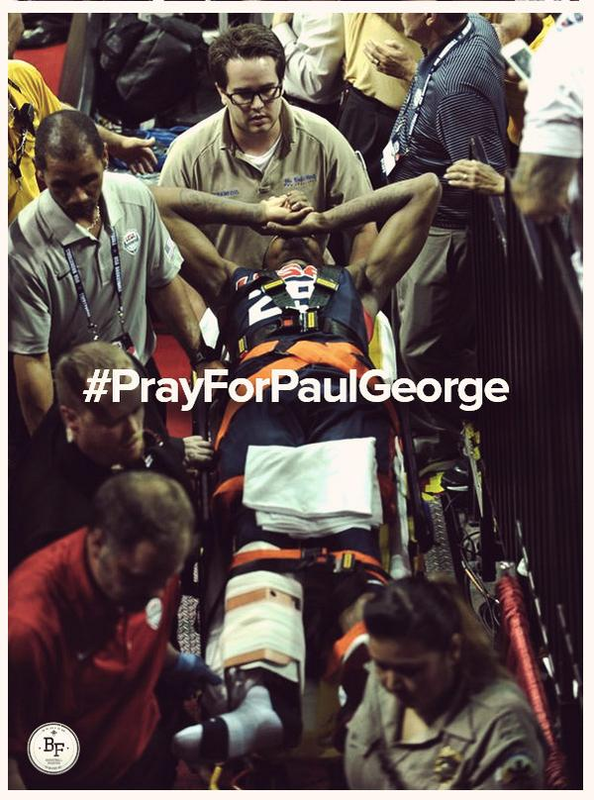 George underwent successful surgery but would “likely miss” the entire 2014-15 NBA season. The injury also gave a deep hole not only to the NBA and the USA basketball program, but also to international basketball as a whole. It was 22 years ago, the USA basketball program allowed NBA players to play for their country in the 1992 Barcelona Olympics after competing with players from the collegiate level. Since the famed “Dream Team”, the USA has won gold in 6 of the last 7 Summer Olympics and 2 FIBA Basketball World Cup tournaments (1994 and 2010). In turn, it allowed other countries to catch up with the sports. Notable examples were Spain, Argentina, France and Brazil who have NBA players play for their respective countries. With Argentina winning gold in the 2004 Athens Olympics, and Spain winning the 2006 FIBA World Championship and finishing silver in the last two Summer Olympics. Only time will tell if whether or not the NBA will continue to send their players to international competition or will this be the end of an era in international basketball. But early into this story, it can be said that international basketball will never ever be the same again. We’ll be on watch on what will happen next. On a personal note, this has been sad. Especially for a guy like me who loves the sport and plays it on a casual level. Some people may call people like me who pay attention to this more than anything else happening in the world “you care less for other things”. It’s true there are other things worth paying attention to than this. But, this means something to me on a personal level. So if you have friends or family members who feel the same way that I do, please do bear with them. Nobody wants to see a terrible injury like this in any sport. So for Paul George who happens to be one of my favorite NBA players not in a red and white Rockets uniform. I wish you a speedy recovery. Hope you can come back better than ever. We hope to see you again on the hard court. This ain’t the end for you. It’s only the beginning. Pinoy Hoops on Pacific Rims. Three Mondays ago, it was the middle of my semester break from school as I was getting set for aa transition from academic life to going into the workplace for my practicum. I was surfing chnnels on TV, when I got to the National Geographic Channel, it was about 5 minutes to 9pm. The 8pm show was finished, they showed a promo that Pinoy Hoops is coming up next. I got curious about what’s with it, so I did not switch channels as I sit back on the sofa and prepare to watch what is to come. Little did I know, I was in for a treat unlike any other. 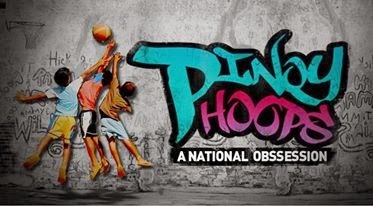 “Pinoy Hoops: A National Obsession” is a three-part documentary series that was shot in 2011 shown within a three week period. 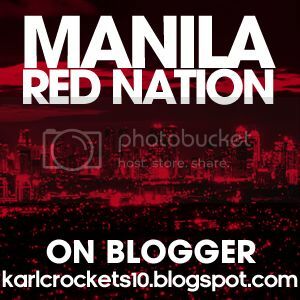 It shows the travels of Rafe Bartholomew, an American sports journalist and “hoop nut” as he goes for a journey across the Philippines to explore the very roots of Philippine basketball as he seeks to discover why is the country obsessed with the sport despite the fact that Filipinos lack of height as it is an important aspect of the sport especially on the international stage like the Olympics and FIBA Basketball World Cup. At the start of every episode, Rafe tells something about himself, from his beginnings in New York to writing the book “Pacific Rims” which I also read and I will also have something about it on this entry later, and the fact that he was a one-time soap opera star on Philippine TV. The first part of the documentary, focuses on the grass roots of Philippine basketball, where Filipinos form basketball courts on any place and surface from abandoned hotel halls to dirt fields in the mountains, to streets outside their homes and even near sanitary landfills. It tackles street ball within the country as it serves as a mean to keep people away from unwanted vices especially in rough conditions most of our countrymen are living into. It also states that footwear like shoes or slippers is not necessarily required whenever playing on the basketball court. It also states a myth where deep in the mountains, the military and the communist forces drop their arms and play basketball over dirt surface courts. Another distinct fact is basketball karaoke where basketball highlights from NBA players like Kobe Bryant, LeBron James, etc. are put into the karaoke which is another Philippine pastime. As well as their obsession with basketball video games like NBA 2K played on coin-operated machines. The second part goes inside the Philippine Basketball Assocation, it was the 2011 Commissioner’s Cup Finals between the Talk ‘N Text Tropang Texters and the Barangay Ginebra Kings (now known as Barangay Ginebra San Miguel). It showcases the history of the league which is the second oldest professional basketball league after the NBA. It goes inside the Ginebra lore starting from the days of “The Big J” Sonny Jaworski who was made “Never say die!” the battle cry of the Ginebra faithful over the years and made it the most popular franchise of the PBA. 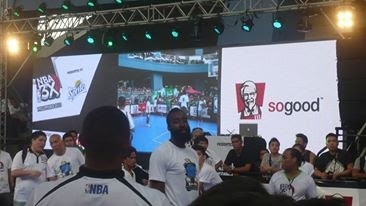 It also stated that unlike the NBA where franchises are representing locations, PBA franchises are based up product names. The second part also gave an all-access pass of the Finals, from both Talk ‘N Text and Ginebra’s practice sessions as well as the games itself. Back then, Talk ‘N Text was coached by current Gilas Pilipinas coach Chot Reyes and Ginebra was coached by one of Reyes’ assistants in the national team in Jong Uichico. It showed highlights of Game 4 which Talk ‘N Text won to take a 3-1 lead, Game 5 where Ginebra kept their season alive, to the title-clinching Game 6 victory of Talk ‘N Text. It also showcases the life of a PBA import as they got into the life of TNT’s import during the conference in Paul Harris. The PBA sets height limits for imports (people of different nationalities other than Filipino) which is a distinct feature of the league as compared to other professional leagues around the world. The final part focuses on four individuals where basketball plays a huge role in their lives. First was Sharon, who is a saboteur hired by different teams to distract opponents in games using different methods which I cannot state here in whole. Tony Lu, the PBA’s legendary photographer who covered the league from it’s humble beginnings to the present, the documentary got into his house where it was stacked with game photos, unorganized but spanning decades. Mang Tom, Alaska’s practice coach and a former PBA referee where they went to the ruins of his old house that was destroyed by Typhoon Ondoy in 2009 and will soon be demolished as it was bought by a development firm as well as his new home up north in Bulacan, and finally JC, the MVP representing Quezon City playing in inter-barangay leagues and his hopes that basketball will bring him a better standing in life. The final part describes what happened to the four as Sharon and Tony Lu continued on with their jobs, Mang Tom retired and is now with family, and JC was given a athletic scholarship. 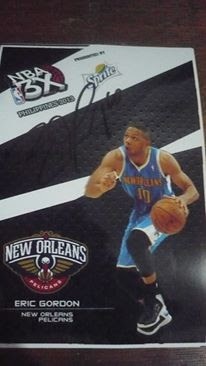 As I watched Pinoy Hoops, I noticed that he wrote a book about Philippine basketball called Pacific Rims. I wanted to the read the book for myself, so I went out to look for and buy the book. It took me a couple of days of searching through different bookstores across the city, then on a Sunday before the last episode of Pinoy Hoops, I finally was able to secure and buy the book. 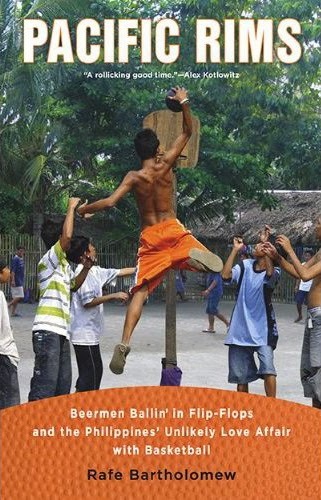 “Pacific Rims: Beermen Ballin’ in Flip-Flops and the Philippines’ Unlikely Love Affair with Basketball” is a book written by Bartholomew in which he writes about his earlier travel to the Philippines as a scholar in 2005 where he went deep inside the story behind the Filipinos love affair for the game of basketball. He spent three years in the country, where he got an all-access pass of the Alaska Aces in the PBA during their Fiesta Conference run in 2007, back then Tim Cone (the legendary coach of the Alaska franchise, is currently the head coach of the San Mig Coffee Mixers) was the head coach. The Aces were led by Willie Miller and import Rosell Ellis. San Mig Coffee was known as Purefoods, Petron was still the San Miguel Beermen, the Tropang Texters were called as the Phone Pals. Rain or Shine was still known as Welcoat, and the Red Bull franchise was still relevant. It also shows his search for the history of the sport from the time of the American occupation of the archipelago to the golden years of Philippine basketball to it’s role during Martial Law with the introduction of the PBA to the time of the legendary imports like Billy Ray Bates and Norman Black until the Fil-Am/Fil-Sham controversy which was a issue in politics. Outside of the league, Bartholomew travels around the country to explore how lives of the Filipino people changed with basketball from stories of good basketball courts being built even in the most remote areas of the country to their lore of watching the sport whether it’s a simple barangay league or watching the PBA live at the venue or the NBA on television where he also stated that the country has a basketball-devoted cable channel in Basketball TV (BTV). What touches me the most about Sir Rafe Bartholomew was he did took the time to learn the Filipino language, during the entire Pinoy Hoops documentary, he was speaking the language fluently, as he was talking to people throughout the course of the story. 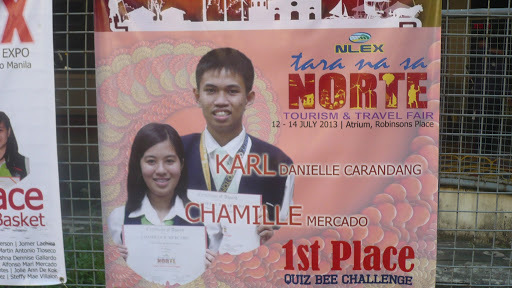 No wonder, people gave him a nice Filipino name in “Paeng Bartolome” and “Kuya Raphael”. He really wrote a great book in Pacific Rims and an excellent documentary in Pacific Rims. One cool thing about him, was during the course of watching the documentary as well a reading his book. He is a very approachable person on the web, as he was replying to my posts about him on Twitter which in turn for me is a great thing to experience. As many people who watched the documentary said three episodes weren’t enough and I definitely agree with them. Even with that being said, I thank Sir Rafe as well as the National Geographic Channel in the Philippines for pulling off this wonderful treat for the Filipino audience. I really hope they can pull off another opportunity to shoot another documentary about Philippine basketball especially the country is back on the international stage as they qualified for the 2014 FIBA Basketball World Cup in Spain. Someday, when he comes back for a book signing, I will definitely have him sign my copy of the book and take a picture with him. Basketball will always have a special place in my heart and soul. The season is over for 14 teams, the other 16, welcome to the Playoffs. *The April 16 (April 17 PHT) game between the Pacers and Celtics from the TD Garden was canceled following the tragic events that happened in Boston. Thus both teams, only played 81 games for the regular season. 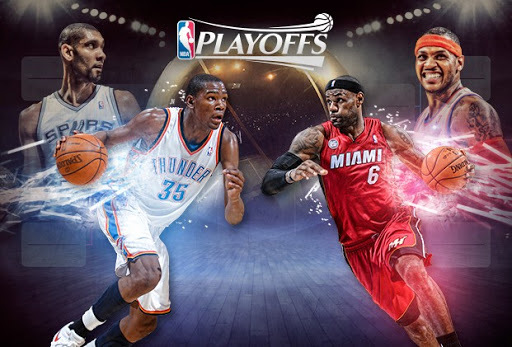 As for the 16 teams that remain, their season continues with the 2013 NBA Playoffs where at the end of it all, two teams(one each from the West and East)will advance to play in the NBA Finals this June. We got some exciting first round matchupsthis season on both sides of the association. In the Western Conference, it will be the reigning Western Conference Champions and the best team in the conference, the Oklahoma City Thunder going up against the 8th seeded Houston Rockets. As former Sixth Man of the Year awardee and the NBA‘s 5th leading scorerJames Harden leads the Rockets back into the Playoffs for the first time since 2009 together with his new buddies in Jeremy Lin, Chandler Parsons and the rest of the high-scoring young guns from Clutch City. Harden and the Rocketswill battle against his former teammates in former three-time scoring champion Kevin Durant, Russell Westbrook, Serge Ibaka and the rest of these young but battle-tested crew from Loud City in what will be a battle between two of the youngest teams in the NBA. Next, it will be a battle between the two most decorated franchises in the Western Conference as the second seeded Southwest Division champions San Antonio Spurs battle the seventh seeded Los Angeles Lakers in a matchup that would have been perfect in the second round or the West Finals. As Tim Duncanwill once again lead these wily and battle tested veterans namely Manu Ginobili, Stephen Jackson, Danny Green, Tracy McGrady and the rest of the guys from the Alamo City to another shot at an NBA title, but that will not be easy as they will go to war against a team where most people who are into basketball would say the “deadliest” lower seed in NBA history as they face the Lakers who despite losing their superstar and the heart of their franchisein Kobe Bryant still pack a punch with Dwight Howard, Pau Gasol and the rest of the men from Tinseltownare still a force to be reckoned with in the NBA Playoffs and can pull of massive upsets. Also, in an interesting matchup, it will be the third seeded Denver Nuggets going up against the sixth seeded Golden State Warriors, as it will be a battle of two different styles of play with the Nuggets led by Ty Lawson and Andre Iguodala playing a balanced attack combined with plenty of athleticism as these men from the Mile High City will also enjoy an impeckable homecourt advantage with the high-altitude in Denver which has been a nightmare for visiting teams. But despite all of that, don’t count these boys from the Bay Area led by the high scoring backcourt of the Splash Brothers in Stephen Curry and Klay Thompson who brought the Warriors back into the playoffs for the first time since 2007, they will also enjoy a great homecourt advantage as the Oracle Arena come playoff time is one of the loudest arenas in the NBA. Finally to wrap up the Western Conference first round matchups, it’s a rematch of last year’s first round match-up as the fourth seededand Pacific Division champions Los Angeles Clippers will once again wage war against the Memphis Grizzlies. There are differences from the last time these two teams met as now the Clippers will have the homecourt advantage this time around and both teams underwent major personnel changes. However, these two teams still play the same way they played last season as the Lob City crew led by Chris Pauland Blake Griffin will battle the Grit ‘N Grind men led by their two big men of Zach Randolph and Marc Gasol. Now, in the Eastern Conference, it will be the reigning NBA champions and the best team in the NBA at the end of the regular season, the top-seeded Miami Heat continue their quest for a back-to-back championship as they begin their playoff run against the eight seeded Milwaukee Bucks who are back in the playoffs for the first time since 2010. The Heat who have been dominant all-season long as testament to their 66-16 record, which includes their 27 game win streak which is second longest in NBA history will once again be led by their Big 3 in reigning MVP LeBron James, Dwayne Wade and Chris Bosh as they will battle a Bucks team led by the backcourt duo of Brandon Jennings and Monta Ellis and will be joined by this season‘s shotblock king in Larry Sanders who made it into the playoffs despite having a losing record, it would be a tall order for these guys from Milwaukee to pick up a victory against these dominant men from South Beach. Then, it will be an Atlantic Division showdown as two bitter rival cities will square off as the Atlantic Division champions, the second seeded New York Knicks will battle their rivals in the seventh seeded Boston Celtics. The Knicks will once again be led by the new scoring champion Carmelo Anthony as the Knicks have risen back to the NBA elite, a thing not seen in the Big Apple for a very long time. They will battle their rivals up north in Beantown as these veterans mixed with young blood led by Paul Pierce and Kevin Garnett who have been playing without their star point guard in Rajon Rondo still have the heart to go to battle in the playoffs. Also, it will be the Central division champions, the third seeded Indiana Pacers going up against the sixth seeded Atlanta Hawks. The Pacers, reclaimed the Central Division for the first time since 2004 when Reggie Miller was still in town. Even with the injury to their main man last season in Danny Granger, they found new life in All-Star Paul George as these well-rounded team from the Hoosier State would look to do better after getting to the second round last season. They will go up against the high flying Atlanta Hawks, in which hometown man Josh Smith has taken reigns as the leader of these men from the Peach State as the Hawks are once again set to make some noise in the Playoffs this year. Lastly out East, in a good match-up, the fourth seeded Brooklyn Nets will square off against the fifth seeded Chicago Bulls. Post-season action is back in the New York borough of Brooklyn as the Nets will host a playoff game here for the first time since 1956 when the then Brooklyn Dodgers battled their cross-town rivals in the New York Yankees for the World Series. The Nets franchise is also back in the playoffs for the first time since 2007 when they still played in New Jersey. These men from the borough will be led by All-Stars Brook Lopez and Deron Williams, they will square off against the men from the Windy City which will be led by their strong starting frontline of Carlos Boozer, Luol Deng and Joakim Noah. The question remains however if their superstar guard in Derrick Rose play in the playoffs or will sit out until next season. One injury that shook the basketball fan in me. On March 31, 2013 (April 1 Manila time), in the Elite Eight matchup in the 2013 NCAA Division I Men‘s Basketball Tournament between the Louisville Cardinals and the Duke Blue Devils at the Lucas Oil Stadiumin Indianapolis, Indiana. We were all witness to one of the most gruesome and horrible injury that we have seen in sports. With the Cards up 21-20 on the Blue Devilsin the 1st half. Duke’s Tyler Thornton fired a three pointer, Louisville’s Kevin Ware came up for the block attempt, he came up short with his block attempt, but as he landed, he landed bad on the floor, as it turned out his foot snapped and the bone came out of the skin. It happened in front of the Louisville bench. As his teammates looked on, they were horrified to see what happened with Ware. Even Louisville head coach Rick Pitino shed tears with what happened to his player. The injury sent the entire Lucas Oil Stadium in disbelief and silence. Even the players and fans from Duke where shocked with what happened with him. The injury Ware suffered is most likely to happen to people who took hard falls on the cliff or went through a vehicular accident. No one had thought that it would happen on a basketball game. The medical team immidiately covered the injury with the towel for people not to see it. Then, Ware before he was carried off the floor to the hospital. Ware asked to talk to his team and said “Don’t worry about me. I’ll be okay, you guys go win this thing.” Afterwards, he was carried off the floor to the chants of the Cardinals faithful of “Kevin”. Eventually, the Cardinals responded to the call of their fallen hero as Louisville defeated Duke to claim the Midwest Regional Championship 83-65. As the Louisville players paid respect to their fallen teammate in front of the Cardinals faithful at the Lucas Oil Stadium. Immidiately after the game, videos and photos of his injury came out on the internet, sending people who are basketball fans (including myself) as well as those who were not into the game into disbelief. They also sent their best wishes to Ware on social media through Twitter on his own Twitter account and Facebook. From NBA players to basketball fans all over the world, they wished the sophomore all the best. He also became an inspiration to fans all over the world, as he was called a “true warrior” for staying strong throughout the experience. Here’s a photo that came out after the injury asking fans to “Pray for Ware”. Ware was sent to a nearby hospital in Indianapolis where he went for a successful two-hour surgery on his right foot. Ware is optimistic that he’ll be back playing once he gets through with his rehabilitation which will take a full year. Now, he’ll be with his team in the Final Four in his own hometown of Atlanta as he’ll look to be an inspiration for the Cardinals’ run to the National Championship. They will face the West Regional Champions #9 Wichita State Shockers in the Final Four on April 6 (April 7 Manila time) where the winner will face the winner between the East Regional Champions #4 Syracuse Orange and the South Regional Champions #4 Michigan Wolverines in the National Championship Game on April 8 (April 9 Manila time). The injury was a horrible sight for me from both the video and photo of his injury which I will not add into this blog entry for it contains graphic content and is disturbing for readers. That injury also made me contemplate about playing basketball. As with any sport though, there is always a risk to deal with playing these games. Despite that, I’ll continue playing basketball for fun as well as time to bond with the people around me and improve on my personal health. Also, I don’t like the fact people had been blaming the injury on the Adidas shoe he wore (The Louisville Cardinals are sponsored by Adidas), sure there had been notable players who got hurt on Adidas shoes, Chicago Bulls star Derrick Rose, Washington Redskins star Robert Griffin III to name some, but I say it’s not on the shoes they wear on their injuries. I’m sure Nike fanatics will take Ware’s injury to show off their dominance on Adidas. For now, we wait if the Cardinals can win the National Championship this year (I’m a fan of the Blue Devils but I now believe the Cards have a reason to win the championship.) 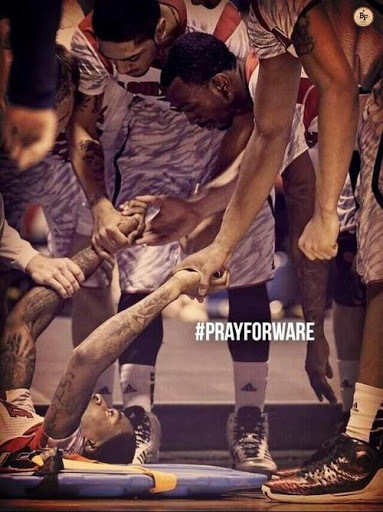 and whether or not Kevin Ware will get through rehabilitation well and be a part of the Cards’ run next year.